Dhaka, 5 July, Abnews: Having analysed the handwritten notes recovered from the Burari house where 11 members of a family were found dead on Sunday, and reviewed CCTV footage from the neighbourhood, the Delhi Police on Wednesday said that the “ritual” was part of a seven-day “thanksgiving ceremony” in which death wasn’t ever in the picture. The Bhatia family was confident that they would survive the ceremony, which prescribed a ritualistic hanging, and had even planned to repeat the ritual with a relative who was facing problems, the police added. “As per the notes, the family’s next plan was to replicate the ritualistic exercise with Tina’s sister Mamta. However, Mamta wasn’t aware of what they had planned for her,” said the officer. “Still, we are looking for a possible outside influence,” the police said. 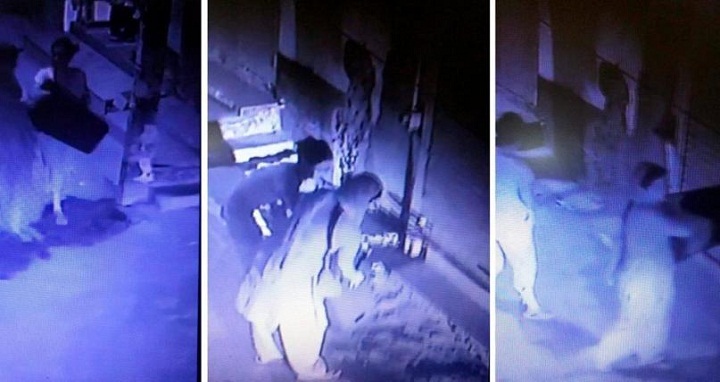 CCTV footage from a neighbour’s house has shown two women members of the family, Savita and her daughter Neetu, bringing stools to the house at 10pm on Saturday; 15-minutes later, 15-year-olds Dhruv and Shivam are seen fetching cables from the family’s plywood shop. “The stools and cables were among the items used in the hanging,” said an investigator. The dead included 77-year-old Narayan Devi, her two sons Bhavnesh (50) and Lalit (45), their wives Savita (48) and Tina (42) respectively, a daughter Pratibha (57) and five grandchildren, Priyanka (33), Neetu (25), Monu (23), Dhruv and Shivam. Police said autopsy reports of Narayan, Bhavnesh and Pratibha revealed that they died of “partial hanging”. On Sunday itself, the police had recovered some notebooks that described rituals early similar to the state in which the bodies were found. On Tuesday, they recovered nine more registers and hundreds of loose pages, also filled with descriptions of rituals. The fresh notes revealed that the writings belonged to at least three different persons, including Lalit and Priyanka. Police said the ritualistic activities began in July 2007, a few months after the death of the family’s patriarch Bhopal Singh. The death had left the family shattered and Bhopal’s third son Lalit Bhatia was most affected. It was during that difficult phase that Lalit began telling his family that he was possessed by his father’s soul and was soon accepted as the head of the family. All the other occupants of the house, except his mother, began referring to him as ‘daddy’,” said a second police officer. Until then, the family was troubled by infighting and financial woes, but as Lalit gradually convinced his family into believing his “reincarnation theory”, the family’s problems gradually vanished, the notes suggested. “Financial suggestions such as investment ideas by Lalit yielded rewards. Peace prevailed in the family and their business multiplied,” said the investigator. The family was delighted when Priyanka found a match in a software engineer earlier this year. Once the engagement took place on June 17, Lalit proposed that a seven-day thanksgiving ceremony be organised immediately, but since the family was hosting relatives during the ceremony, they waited until June 23 when the last guest left. “Keeping the ceremony a top secret was part of the ritual,” the officer said. “The first six days, according to the notes, involved rehearsals in which they would bind their limbs, blindfold themselves and tie the noose around their necks. CCTV footage confirms the stools and cables were brought in on the last day,” said the officer.